ABB RJ Flexit presentation. CMC. 22 April 2015. ABB Corporate Research, Västerås, Sweden. 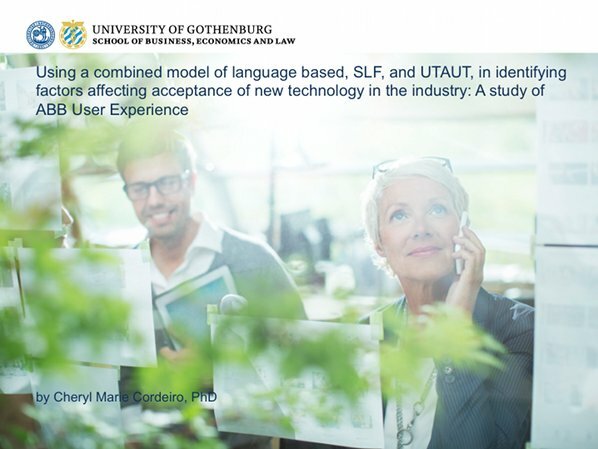 The proposed title of the project is Using a combined model of language based, SLF, and UTAUT, in identifying factors affecting acceptance of new technology in the industry: A study of ABB User Experience. 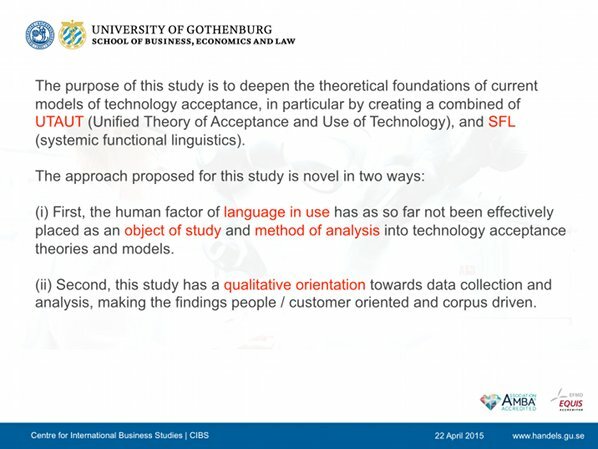 The aim is to use a combined model of analysis for technology acceptance, based on natural language SFL (systemic functional linguistics) and the most comprehensive technology acceptance model, the UTAUT (Unified Theory of Acceptance and Use of Technology) in order to deepen both the theoretical and empirical understanding of new technology acceptance. While this might sound complicated due to the specialized field specific vocabulary, the principal idea behind this not too complicated. It’s basically a research proposal that puts more a more human oriented perspective on the construction, deployment and use of new technology, by integrating a more conscious awareness of how natural language is used, and what that can tell us about human-computer, or human-machine interaction. And perhaps it is about that time too, to bring back into focus, what humans have as one of the main means of communicating with each other, natural language, in order to build better technologies for the future. The trend already is that AI and robotics are becoming more human oriented, the launch of YuMi for example, shows how much technology is expected to integrate more into the work lives of humans for the future. It’s a seeing, sensing and learning robot. And all of the building of software and hardware, assessing it, and improving the designs of which that we don’t really think about, is done through the use of natural language. 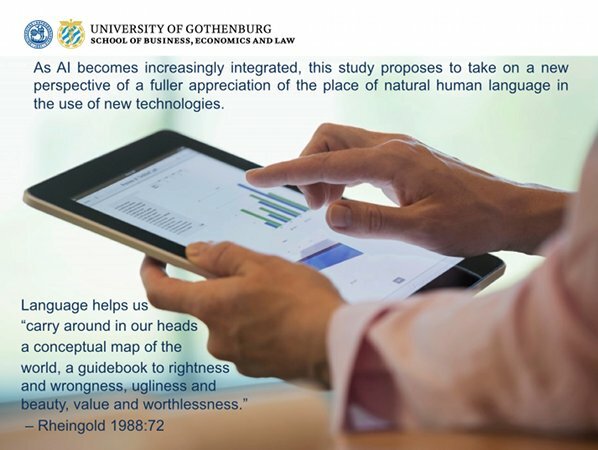 As AI becomes increasingly integrated, this study proposes to take on a new perspective of a fuller appreciation of the place of natural human language in the use of new technologies. Language remains one of the most fundamental, universal and flexible of existing codifications. We use language to identify the objects and events around us, and to tell stories of our group and ourselves. We describe experiences, express feelings, and draw others into our own personal realities through language. We use language to ask for information, to explain, to argue, to question, to teach and create functions of AI. Although it is rarely visible to us, language is our conceptual map of the world, in our heads. And what is in our heads, is bound to be actualized outwardly in terms of behaviour and in terms of creation, materialization. But language is not only something to be studied as an object. It can also be studied as a process (language is an evolving entity, where you can track changes with tracking language), and it can be used for its metafunctional properties. Meaning to say that you can use language to describe not only its own dimensions, but dimensions of other systems. 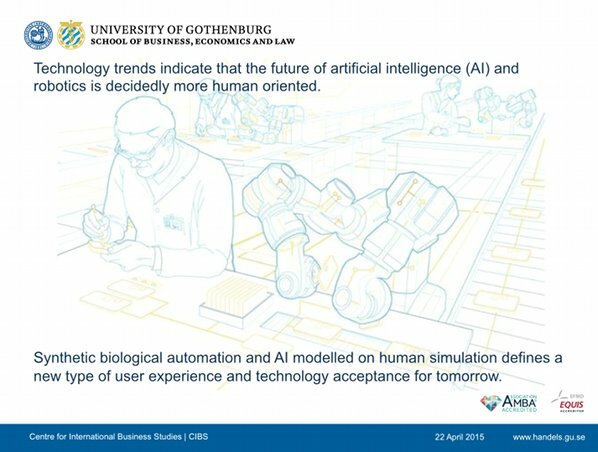 In the context of ABB as a global leader of robotics and AI technologies, what this means is to push the forefront of understanding of now just what / which technologies are accepted more readily now, but it can provide a trajectory of what users in the future prefer. So it’s a trend creating / predicting feature when you bring natural language into building technologies. 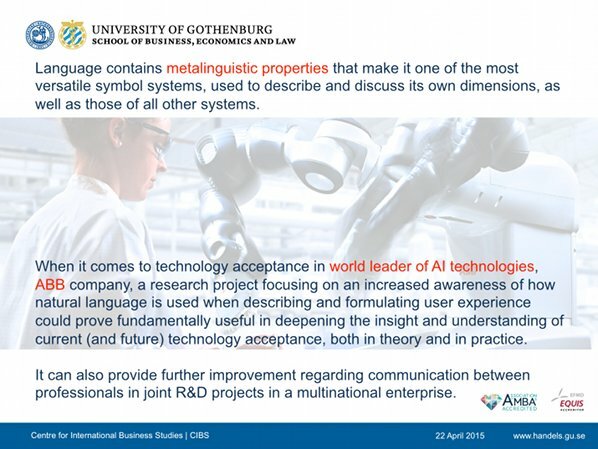 So the novel contribution of this perspective of language in use in technology acceptance, is to bring a true humanities science – the science of language – into engineering and technology building. 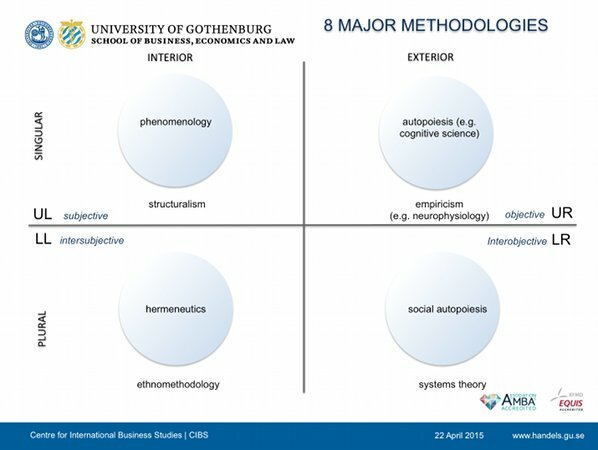 This is rarely done outside the field of sociolinguistics, and as I understand, it is complementary to most other types of user experience dimensions such as the study of psychology or behavioural science in user experience. Language can be said to provide that over-arching contextual network in which to study technology acceptance. This study is also novel in the sense that the data collection and analysis of data is qualitative, and systematically corpus driven. This slide shows in diagrammatic format, what you can do with systemic functional linguistics (SFL) in the study of language in use. What areas of knowledge you can gain access to with its application. 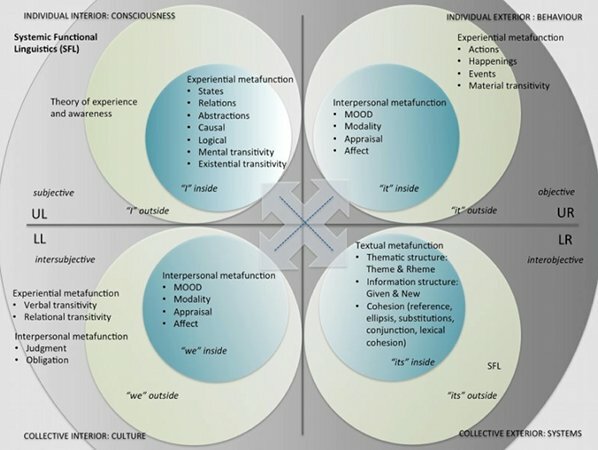 What you’re looking at is an integrated view of the different types of knowledge zones that we can have access to by the study of language in use, from individual consciousness (UL), to behaviour (UR), to a broader collective perspective (LL, culture, social values, group values) and to the system itself (LR). In conclusion, bringing natural language and combining that with current technology acceptance models like UTAUT, would give a certain dynamism to the perspective of user experience. You’ll find maybe greater language versatility, or greater cross-cultural flexibility in thinking when using technologies. 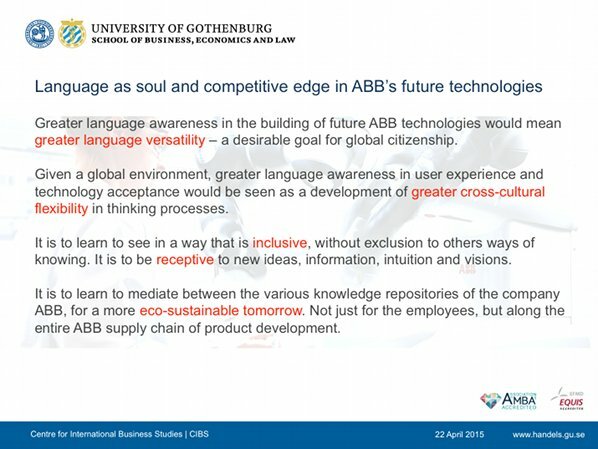 You might find a way for an inclusiveness of technology use that was not there before, and because you are dealing with language, then you might also find a way to ‘unlock’ language conflations, for people to be receptive to new ideas. An example of this is how at the Volvo Car Corporation Chengdu Plant, in the Chinese language, they realized that asking questions also carried the implication that you are saying that the person whom you asked the question to, is doing it wrong. How do you de-conflate that conception of asking questions in Chinese and get your employees to speak up? Because they need to ask questions if they do not understand or they will not get their job done. And with a focus on language in use, you might also then be able to access repositories of knowledge you already have, that helps towards the goal of building eco-sustainable technologies. Not just for ABB but for those along the supply chain and in the global network. 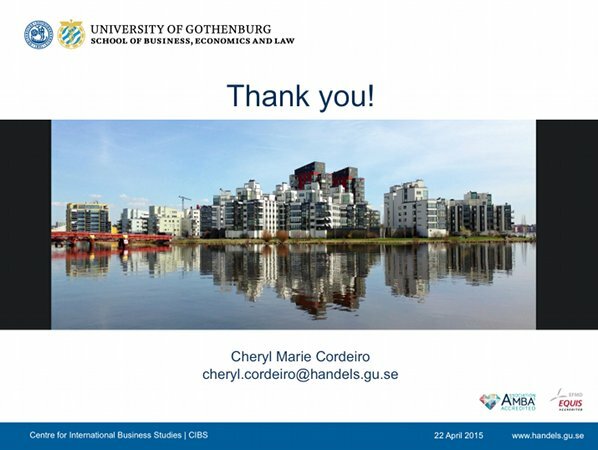 So we’re talking about knowledge dissemination in people behaviour and product development.